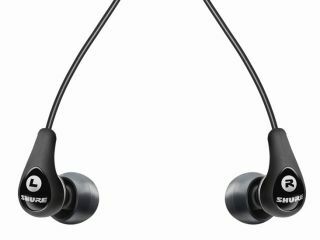 We've had a sneak peek at Shure's new SE series of headphones at CES. The new headphones range from £100 to £330 and offer superb sound performance. We know, we've heard them. Our pick is the £170 SE310 model as it's probably the best balance between sound quality and cost. The Hi-Definition MicroSpeaker is joined by Shure's Tuned BassPort technology. This gives superb bass - especially when we were listening to the Chemical Brothers in our demo. The £100 SE210 is designed with a Hi-Definition MicroSpeaker to provide full-range audio distinguished by an optimal high frequency response. Next up is the £250 dual MicroSpeaker SE420. These headphones have a pair of dedicated tweeter and woofer. An internal crossover sends lower and higher frequencies to dedicated drivers so that lows, mids and highs are distinct. The SE530 headphones are £330 and feature Triple TruAcoustic MicroSpeakers - a dedicated tweeter and dual woofers. The SE530PTH also includes the Shure Push-To-Hear Control (PTH) which means you can press a button to hear what's going on in the room without removing your headphones. An internal crossover routes audio to a dedicated tweeter to ensure that highs and mid-highs are detailed, while two dedicated woofers provide the ultimate in balanced lows and low-mids and full-bodied bass.